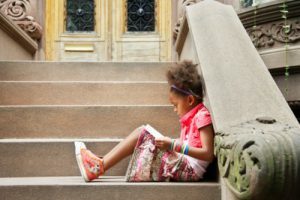 Does your child dread summer reading? If they don’t like the assigned books, that’s one thing, but if they’re not interested in reading at all, there may be a problem. Often it takes a parent’s guidance to ignite a child’s passion for reading. Luckily, summer is the perfect time to transform your child from a reluctant reader to an avid one. But how? Reading to your child from an early age is a great way to get them hooked. Choose a book you think your child will love and read the first few chapters aloud to them. If they seem to like the book, ask them to read a few chapters to you. Before you know it, they’ll be unable to wait and will zoom ahead in the story – the desired effect. You may need to try a few books before you find one that captures your child’s imagination. Once you do, make a mental note of what kinds of stories they like: stories with a plucky female heroine? Stories about adventures on the high seas? Suspenseful stories? Stories about magic? If you can crack the code to your child’s reading interests, it’ll make a trip to the library or bookstore a lot more fruitful. It doesn’t have to be a book that introduces your child to a story or character. If your child loved the Harry Potter, Hunger Games, or Diary of a Wimpy Kid movies, introduce them to the books next. Pique their interest by telling them the movie is only a small part of the story – which is usually true. To get the full picture they need to read. If your child loves being online, you can make reading a multimedia, interactive experience. Have your child go online and connect with other fans of a book. There are lots of activities they can do to flush out the story, like drawing scenes or characters from the book, writing their own fan fiction, or even dressing up like their favorite characters. Your encouragement and interest will make it much easier for your child to develop a lifelong love of reading. Try to read some of the same books as them. Ask about their opinions on the story, what they expect to happen next, and what they would change if they were the author. Their answers may surprise you!